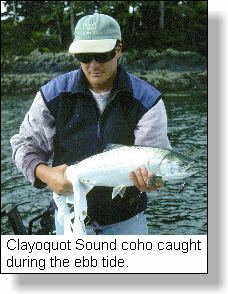 "Tides for Salmon Fly Fishing Success"
When to fly fish for feeding coho and chinook? 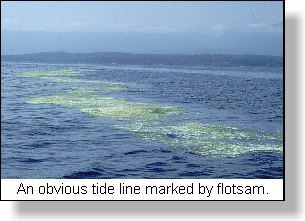 Which tides are more productive; during flood tides, ebb tides, at the slack, or, at mid tides? This is one question, that plagues salmon sports fishers when they venture out for a day's fly fishing on coastal waters. When baitfish fry move from the open waters to concentrate near shore areas during spring and summer, it has been my experience that low tides become a major factor in the saltwater fly fisher's success. Some years ago I was fortunate to be on holidays during an early summer period of daily dropping tides. I was also fortunate to be fishing an area where young herring were concentrated and a feeding school of coho and chinook had congregated. The salmon were feeding in the morning, during the time of the ebb tide, and it gave me the opportunity to fully appreciate the importance of low tide for the saltwater salmon fly fisher. they completely blocked my view of the cobblestone bottom. It was a situation and circumstance that I have found is repeated yearly throughout numerous areas of the Strait of Georgia and in particular around the southern shores of numerous Gulf Islands. I have since found, as I did during that initial experience, that anchoring my boat calms the panicky herring and gives me the chance to watch for cruising feeding salmon. The salmon, when they appear tend to follow any underwater trough which is available, the dips in the ocean bottom that give them an additional few centimetres of depth while they cruise under the herring. Yes, a critical fact that I have noted is that salmon will cruise under herring schools apparently searching for any baitfish that is crippled or swims unnaturally. It is on these crippled fish that they prey and it is one of the primary seasons I have found why they will take a saltwater fly! In the early spring, during April and May, bluebacks concentrate in schools while they feed on euphasiids, the commonly called 'pink' feed. Early in June these 'blueback' coho and pinks begin to change their diet from gorging on euphasiids to glutting on the young herring which by this time of the year are free swimming clouds of fry. It is this latter silver bounty, this high level protein which gives the salmon their summer adult growth. June and July are usually marked by two or more extreme morning low tide periods. 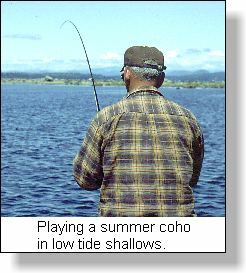 For the fly fisher these daily low tides fortunately coincide with travelling schools of coho and chinook. It is in the early summer when they have switched to feeding on young herring that salmon become accessible to the fly caster in the shallows created by these low tides. I have found that by carefully studying my tide guides I am able to predict when the shallows will have concentrations of baitfish. Each day is different because of different heights of water with the result that as each day progresses I hoist my anchor and move closer to the shore to be where the concentrations of young herring are the greatest. Salmon action is obvious in these shallow areas as surfacing crescent prays of herring mark the movement of these aquatic predators. 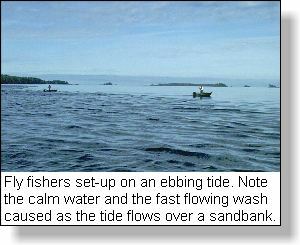 Moving the boat is critical for the salmon hover on the outskirts of the masses of herring periodically prodding or cruising under the mass for ripples. I have found that coho salmon have a highly developed degree of teamwork as they will often hunt in small predator schools of up to a dozen fish. They will force the herring into clusters up against any object like large tidal rocks. Here is where a cast fly can be retrieved slowly and most effectively. Anchoring and casting alongside kelp beds which harbour baitfish provides another key salmon fly fishing low tide location. The ebbing tide will expose the kelp and give the fly fisher the opportunity to choose those bays in the kelp where the herring concentrate and where there is a decided drop-off on the underwater shelf. An important tip for kelp fly fishing is to anchor in or at the edge of the kelp and cast out into deeper water so that your fly on the retrieve appears to be seeking the safety of the kelp. This past summer while fly fishing in Clayoquot Sound waters We hooked numerous feeding coho under and near tidal flowing kelp fronds during the early ebb tide and, during the early flood tide. In one area, kelp was scattered out into the bay in single stalks as well as concentrated near the rocky shore of an island. Both young herring and young needlefish were concentrated and stacked around the kelp. We found that by casting our Scientific Angler Super Fast Uniform Sink lines towards kelp fronds, letting them sink slowly in the moving tide, then slow strip retrieving, we were consistently hooking coho in this very fishy location. activity to capitalize on that specific salmon tide time. Do remember to save time to hunt and explore during every trip. New schools of salmon are arriving in fishing waters almost on a daily basis and their particular tidal feeding will often differ from those salmon you have originally targeted. Is there one tide that is best? No, while my preference has been for ebbing tides, my decades of chasing saltwater salmon on the fly have shown me that because salmon are transient they are also opportunistic feeders. Take the time to explore, search and experiment on all tides for it is rare that only one tide situation provides active feeding salmon.